You can’t make an informed decision about which enzyme supplements to buy unless you have some understanding as to what it is you’re actually buying. And you need to be sure that the person designing the formula you buy actually knows what they're doing so you can be confident that the formula you buy from them will work as advertised. We'll explore in some detail what enzymes are and what they do and the different kinds of supplements in which you'll find them. We'll also explore the issue of stomach acid and why, for most supplemental enzymes, it's not much of an issue. In separate newsletters, we'll cover digestive enzymes in detail (including a discussion of the role hydrochloric acid and bile play in the digestive process) and systemic, proteolytic enzymes--including the "hot" enzymes "de jour", serrapeptase, nattokinase, and Seaprose S (AKA Protease S). Although at first glance, digestive and proteolytic enzymes appear similar (and often use some of the same enzymes, and can, in certain circumstances, be used interchangeably), digestive enzymes and systemic proteolytic enzymes are, in fact, very different in formulation, purpose, use, and effect. But we'll save those discussions for separate newsletters. For now, let's talk about enzymes in general. Enzymes are large biological molecules (mostly proteins) that speed up or catalyze chemical reactions in living organisms. They play a critical role in everyday life. In fact, they regulate every single part of your body. All of your tissues, muscles, bones, organs, and cells are run by enzymes. Enzymes allow many chemical reactions to occur within the constraints (temperature, oxygen levels, acid/alkaline balance, etc.) of a living system. As organic catalysts, they are involved in, but not changed by, chemical reactions; and they do not alter the equilibrium of those reactions. Enzymes do not make a reaction occur that would not occur on its own, they just make that reaction happen much faster. Like all catalysts, enzymes work by providing an alternative pathway that requires lower activation energy for a reaction than would otherwise be required. By bringing the reactants closer together, enzymes can help make chemical bonds weaker, thus helping reactions proceed faster than they can without the catalyst. The net result is that an enzyme can actually make a reaction many millions of times faster than would be possible without that enzyme. This is important since these "reactions" govern every function in your body, not to mention the destruction of viruses, bacteria, and cancerous cells. It's not hard to understand how increasing the speed of a chemical process in the body several-millionfold could change things dramatically. And the most amazing part is that enzymes are not permanently altered in the process of catalyzing a reaction. They may be changed briefly during the process, but at the end of a reaction, enzyme molecules are unchanged from where they were at the beginning. This means that a single enzyme molecule can be used over and over to catalyze the same reaction. You don't need more enzymes to replace ones that are lost; you need more of them so that they can act on more of the substrates at one time. In other words, the more enzymes present, the faster the reaction will go. Also, although enzymes are not "used up" in doing their job, they can be used up by being eliminated--by being physically removed from the body. For example, digestive enzymes are not used up in the process of digestion. But they are "used up" by being pushed along with your food as it's being digested and passed out of your body in your stools--thus the need for new digestive enzymes to process your next meal. Another way to describe what enzymes do is to say that they create an environment that makes reactions in the human body more energetically favorable. When we use the word "environment" here, we're not talking about a big, complex ecosystem kind of thing, but rather, a very small focused area where chemical transformations take place. In fact, with enzymes, the "environment" is a tiny place located on a single molecule. This environment, referred to as an "active site" is a groove or pocket on the surface of the enzyme inside of which the substrate (the substance that is the focus of the chemical reaction) gets bound and then undergoes reaction. This pocket or groove is most often lined with amino acids whose side chains bind the substrate and aid in its chemical transformation. It should be noted that it is the particular mix of amino acids found in an active site that both provides the specificity as to which substance/substrate that enzyme works on and how much it speeds up the reaction. Enzymes are highly specific as to the substrates they bind; any given enzyme can only catalyze one specific reaction. For example, the lactase enzyme can only bind with the lactose sugar found in dairy products. It cannot bind with proteins; it cannot even bind with other types of sugar such as sucrose or fructose--just lactose. As mentioned, the active site is extremely small--actually, in most cases smaller than a strand of DNA. And yet, most enzyme molecules are extremely large, much larger than the substrates they act on--including other proteins. Which brings up the question: if enzymes are large, but only a tiny portion of the enzyme is active, what does the rest of the molecule do? As it turns out, the inactive portion plays some combination of the following three roles--with the exact combination varying from enzyme to enzyme. As we have discussed previously, enzymes are protein molecules that fold up into complex balls. This folding process is not random. It is very specific for each enzyme…and for the active site in each enzyme. In fact, for the active site to function properly, it must "conform" to a precise, three dimensional shape. Any variation in this shape will change its function. As a protein, the enzyme itself spontaneously folds into a predetermined, specific configuration based on the particular mix of amino acids in the enzyme and the environment in which the enzyme finds itself. For example, some proteins unfold in the presence of acid or water. Others fold more tightly when in either of these environments. This is why many supplemental proteolytic enzymes are unaffected by stomach acid. They are programmed to ball up in the presence of acid--not unfold. To make a long story short, the fact that the amino acids in an enzyme cause it to fold into a particular shape forces the active site to also conform to a particular shape and have the correct spatial orientation. Although the active site determines what substrate a particular enzyme will act on and what its effect on that substrate is, it is the bulk of the enzyme that plays the major role in regulating the speed at which that effect takes place. It does this in several ways. First it can control the amount of enzymes that are present by signaling your body to turn the gene that produces more enzymes like itself on and off. It also makes use of inhibition and modification. These processes involve binding other molecules to the enzyme to slow itself down. To facilitate this, many enzymes contain regulatory sites that specifically bind inhibitors allowing the cell to quickly affect activity. In addition, many enzymes require binding by other proteins to become active, or to increase the speed at which they work. The bottom line is that protein-binding domains on an enzyme often account for a large portion of the enzyme's size and structure. One of the key aspects of an enzyme's activity is where that enzyme is active--and that "where" can mean a location within the body, or within a cell itself. Pepsin, for example, is active in the stomach, but not in the cell in which it is produced. This holds true for enzymes that work inside cells themselves. It is essential that each enzyme be transported to and kept in its special place--and that it be inactive when it's where it does not belong and active only when it gets where it's supposed to be. This is accomplished by sections of amino acids contained within the inactive portion of the enzyme known as "protein recognition tags." To summarize where we are so far, without enzymes, all metabolic reactions would progress through the same steps, but would go too slowly to serve the needs of the cell. In addition, enzymes often work together in a specific order, creating pathways involving multiple reactions. After each enzyme reaction, the product of that reaction is passed on and used as the raw material (substrate) for another enzyme to work on. Metabolic pathways control cell metabolism. Cell metabolism is the process (or really the sum of many individual processes) by which living cells take in nutrients, eliminate waste, and maintain life. For all of the above reasons, it is not unreasonable to say that enzymes are the stuff of life. By allowing reactions to happen at far lower energy thresholds, they make life happen where otherwise there would be none. In the movies, Victor Frankenstein used electricity to create life; he probably would have been better served using enzymes. There are thousands of different enzymes in the human body. The exact number is unknown, but estimates range from 55,000 to as many as 75,000--the vast majority, as yet, unidentified--and each one is responsible for facilitating one specific chemical reaction required to keep the body running. When it comes to the vast majority of these enzymes, there is very little we can do to change their numbers and impact on the body. That said, many medications specifically try to do just that. They work by increasing or inhibiting either the production or efficacy of a particular enzyme--either in your body, or in the body of an invading pathogen. Penicillin, for example, works by dissolving the cell walls of invading bacteria, literally disintegrating them. The way in which it does this explains a lot about enzymes. One essential component of the bacterial cell wall is transpeptidase, which accepts molecules of penicillin as a substrate attachment. The penicillin is then activated by the enzyme, which again is in the bacterium's cell wall. The activated penicillin, which is now locked into the cell wall of the bacterium, then prevents normal peptidoglycan reactions which are needed to strengthen links in the cell wall. This progressively weakens the bacterial cell wall until it ultimately breaks down, disintegrates, and the bacterium dies. Can enzymes be taken orally and impact chemical reactions both within the gut and the bloodstream and produce multiple beneficial effects, or are they destroyed by stomach acid? There are some sources on the internet that would have you believe that orally administered enzymes are an absurdity because, as they say, "Since enzymes are proteins, your stomach acid digests them before they can have any beneficial impact in your gut--let alone enter your bloodstream." As it turns out, it is not supplemental enzymes that are absurd, but these claims. And they can be proven wrong in many ways, but the simplest is to give three real world examples: pepsin, amylase, and lactase. Pepsin is an extremely powerful protein digesting enzyme that thrives in the high acid environment. It is produced in your stomach, and it not only works with the hydrochloric acid in your stomach to break down proteins, it actually requires hydrochloric acid to be produced in the first place. Here's the sequence. Pepsinogen is secreted by the chief cells in your stomach. By itself, pepsinogen is inactive and will digest nothing until it is converted into pepsin. Pepsin is produced when pepsinogen comes in contact with hydrochloric acid in the stomach. This is actually a remarkably elegant maneuver by your digestive system. Since pepsin literally digests protein, you don't want pepsin active in the chief cells themselves or it would digest them. Thus the chief cells release inactive pepsinogen--pepsin's precursor-- which is converted into pepsin only after the pepsinogen has made its way out of the chief cells and into the stomach itself, where it is converted in the presence of stomach acid. Since the wall of the stomach is coated with mucous, it is protected from the active enzyme. Pepsin can only digest your meal and not your stomach. On a related note, stomach acid doesn't actually digest protein; it merely unfolds proteins. That's where pepsin comes in. Pepsin is what breaks the bonds between amino acids that make up proteins; thus, it is the pepsin that digests proteins. The hydrochloric acid is merely the setup man in the process. On this one example alone, the claim that stomach acid destroys enzymes in orally ingested enzymes does not stand up to the prima facie evidence. The simple truth is that most supplemental proteolytic enzymes are too big and complex to be unfolded by hydrochloric acid and thus pass through the stomach unscathed by pepsin. Now it is true they can be "rendered inactive" by the high acid environment of the stomach, but that doesn't mean that they are destroyed--simply that they are reactivated upon reaching a more alkaline environment such as that found in the intestinal tract or the bloodstream. Another example is amylase. Amylase is present in your saliva and mixes with your food when you chew it. If it were destroyed as soon as you swallow your food and it contacted stomach acid, then it would accomplish nothing? Why would your body do that? And the answer is simple: it isn't destroyed by stomach acid. It works on digesting carbohydrates in your food while it's in your stomach. That's why your body produces amylase in your saliva--so it can break down carbohydrates both while you chew your food and after you swallow it. Or to borrow another phrase from the legal profession: res ipsa loquitur--the thing speaks for itself. The coup de grâce is lactase, which is added to dairy products as a supplement to allow people who are lactose intolerant to eat dairy products. The fact that it works speaks for itself. The bottom line is that some enzymes, such as serrapeptase, are "fragile" and can indeed be neutralized by stomach acid. If you take those as a supplement, the capsule they are contained in must be enteric coated to protect them in the stomach. But most other digestive enzymes are not destroyed by stomach acid, just rendered temporarily inactive by the high acid environment. They reactivate as soon as they enter the more alkaline environment of the small intestine. And finally, there are some digestive enzymes that are not only not destroyed by stomach acid, they are, in fact, optimized by the high acid environment. Pepsin, as we already mentioned is one. But in enzyme supplements, you will find "acid stable protease" listed on the label. The name says it all. So where do enzymes come from? As it happens, metabolic enzymes are produced internally (in every cell in your body, but most notably, in the pancreas and the other endocrine glands). Digestive enzymes are produced in the pancreas, the stomach, and the salivary glands, and they are present in all of the raw foods that we eat. In addition, many foods contain an abundance of antioxidant enzymes. Stabilized rice bran, for example, contains several thousand beneficial enzymes including glutathione peroxidase, methionine reductase, polyphenol oxidase, CoQ10, aspartate amino transferase Isozyme AAT-1 & AAT-2, catalase, and superoxide dismutase (SOD), which is an exceptionally powerful antioxidant. So what's the problem? Why do we have an enzyme deficiency? First of all, there's diet. How many people regularly eat enzyme rich foods? How many people eat the foods that contain everything needed for the body to manufacture its own enzymes? Enzymes are comprised of amino acids, the primary components of which are carbon, hydrogen, nitrogen, and oxygen--not particularly hard for the body to get. However, your body also requires both minerals and trace minerals to manufacture those proteins and enzymes out of amino acids. For example, selenium is a trace mineral that is needed by the body in small amounts to make proteins and enzymes. That means if your diet is selenium deficient, your body is going to be unable to manufacture enough enzymes for either digestion or metabolic purposes. And then there's the enzyme reserve. At birth, we are endowed with a certain potential for manufacturing enzymes in our bodies, an enzyme "reserve," if you will. Nature intended that we continually replenish that reserve--or at least take the burden off of it--through proper nutrition and eating habits. Unfortunately, that just doesn't happen. Let's take a look at why. Most people believe that when you eat a meal it drops into a pool of stomach acid, where it's broken down, then goes into the small intestine to have nutrients taken out, and then on into the colon to be passed out of the body--if you're lucky. Not quite. What nature intended is that you eat enzyme rich foods and chew your food properly. If you did that, the food would enter the stomach laced with digestive enzymes. These enzymes would then "predigest" your food for about an hour--actually breaking down as much as 75% of your meal without any assist from your body itself. After this period of "pre-digestion," hydrochloric acid is introduced. This creates a high acid environment (low pH) that inactivates (but does not necessarily destroy) many of the food-based enzymes. The hydrochloric acid than begins to unwind many (but not all) of the proteins present in the food, which allows the pepsin enzyme present in the stomach to begin its own function of breaking down what is left of the meal. Eventually, this high-acid, nutrient-rich food concentrate moves on into the small intestine. Once it enters the small intestine, it stimulates the pancreas to release bicarbonate, which neutralizes the acid and reactivates many of the enzymes that were inactivated in the stomach, along with introducing many pancreatic digestive enzymes of its own. As digestion is completed, nutrients are passed through the intestinal wall and into the bloodstream. That's what nature intended. Unfortunately, most of us don't live our lives as nature intended! Since there are no enzymes in the food, it sits in the stomach for an hour, like a heavy lump, with very little pre-digestion taking place. At that point, stomach acid is introduced at extra high levels to compensate for the lack of pre-digestion (a major factor in the onset of acid reflux disease). But high levels of stomach acid cannot fully compensate for the lack of pre-digestion. So even after the stomach acid and pepsin have done their work, the typical cooked/processed meal enters the small intestine largely undigested. It uses up many of the amino acids, minerals, and trace minerals required for manufacturing metabolic enzymes that are also required. In other words, forcing the body to compensate for insufficient digestive enzymes guarantees that, as you age, you will produce insufficient metabolic enzymes. It's all connected. The bottom line is that regular supplementation with digestive enzymes takes stress off the pancreas (and the entire body) by providing the enzymes required for digestion. In other words, digestive enzyme supplements may just be one of the best insurance policies you can give your body so you can enjoy a long and healthy life. Back in 2004, my wife, Kristen, addressed the question, "Which one product does Jon use most?" "Hands down, it is digestive enzymes. Every time we eat (cooked or raw), Jon and I use digestive enzymes. Why? Because, as we've already explained, using enzymes takes a great deal of stress off your body, protects your pancreas, significantly increases the amount of nutrition you get from your food, reduces allergies, and protects against acid reflux. They say we dig our graves one forkful at a time. Supplementing with digestive enzymes helps slow down that process. "Jon and I also used to take digestive enzymes when first waking up in the morning (before eating) and at night (before bed), but since Jon created his systemic proteolytic enzyme formula, we use those instead for cleaning out the blood and eliminating circulating immune complexes from our bodies -- using the digestive enzymes strictly for food." It's now 10 years later, and the answer would still be the same. A significant reduction in indigestion and heartburn problems resulting from too much acid in the stomach. Relief from gas and bloating. Improved digestion of dairy products. Diminished food allergies due to more complete protein digestion. An increase in energy levels. Note: Be suspicious of any enzyme formula that lists only the mgs of enzymes present as opposed to the activity level of each enzyme in the formula. The FDA only requires milligrams on the label, but activity level is what you're after. Two batches of the same enzyme of equal weight can have wildly different activity levels. The bottom line is that when it comes to enzymes, weight measurements are just not useful and can be downright misleading, as there is no direct relationship between weight and units of activity. In fact, an enzyme can still have a weight even if it has been destroyed and has zero activity. When comparing enzymes, if you want an apples to apples comparison, you need to compare activity levels. The internationally recognized and accepted standard for measurement is by Food Chemicals Codex (FCC) Units. This is usually expressed in different activity units for each type of enzyme. Technically the FCC comes before all of the units as in FCC CU (for cellulase units), but is usually not included on labels, which will show just CU or HUT or FIP, etc. The possibilities offered by proper supplementation with digestive enzymes with your meals and proteolytic enzymes between your meals are obviously very exciting. 2. Oelgoetz AW, Oelgoetz PA, Wittenkind J. "The treatment of food allergy and indigestion of pancreatic origin with pancreatic enzymes." Am J Dig Dis Nutr 1935;2:422--6. 3. McCann M. "Pancreatic enzyme supplement for treatment of multiple food allergies." Ann Allergy 1993;71:269. 4. Edward Howell, Enzyme Nutrition: The Food Enzyme Concept (New Jersey: Avery Publishing Group, 1985, 81. 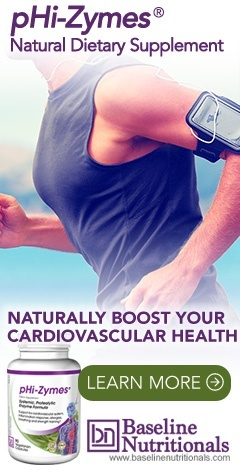 Most of Jon Barron's recommended formulas are sold at Baseline Nutritionals, where you will also find their coupon codes. How about the live enzymes in 'miso " ? I love your expertise, Jon ...please keep doing this wonderful much appreciated health info ! Miso contains both live enzymes and live probiotics, primarily lactobacillus. However, as with all enzymes and probiotics, they are destroyed by sustained exposure to heat—so how much value you get out of the miso depends on how much you cook it. How do I buy the enzyme you recommend? The Baseline of Health Foundation is a non-profit and does not sell products, merely provides information. Most of Jon Barron's recommended formulas are sold at Baseline Nutritionals, such as these formulas. To see a full list of products, just click on "products" above and you will see the list of formulas and the companies that sell them. I found this article very interesting. I have been reading up on digestive enzymes gor years and trying to eat the right kind of food. I have alsi been raking serrapeptase for a little while now as I am unable to take painkillers. The serrapeptase have been very helpful and I look forward to reading your info when you write it. Thank you. I live all if your newsletters. It is without question that you are the most credible, informative nutritional researcher existing today! Being an engineer (PH.D M.E. ), I too share some of your qualities, although not in the same area. It's like Albert Einstein said, "It's not that I'm so smart, it's just that I stay with my problems longer!" I am not easily impressed, but I am surely impressed with your transmittals, which is indicative of a really "sharp" mind; congratulations for sure! when you said " that some enzymes, such as serrapeptase, are "fragile" and can indeed be neutralized by stomach acid. If you take those as a supplement, the capsule they are contained in must be enteric coated to protect them "
And may, if I use warm water to speed dissolving the capsule, be helping also? Hoping for that I'm taking "Doctor's Best' serrapeptase which is not coating. Am I wasting my money and don't getting any benefits from it? (I just can't afford your formula). Also - I'm allergic to penicline - are fungal protease and fungal pancreatin are bad for me? I also try Nattokinase, which gave some bad side effects (palpitation etc.) and what the side effects of serrapeptase that you mentioned ? Most companies that use serrapeptase use enteric coating to protect it because it is fragile. If it’s not enteric coated, it doesn’t mean that a substantial amount doesn’t reach your bloodstream—just that it’s now open to question. Fungal protease has nothing to do with penicillin. Keep in mind that mushrooms are fungi. As for warm water, remember that any sustained temperatures over 118 degrees F will destroy the enzymes. Was it pure nattokinase, or was it low grade with impurities? Were there other ingredients in the formula? How much nattokinase was in the formula? What happens if you take a lower dose and build up slowly? What is the best name brand of proteolytic enzyme I can purchase? My daughter has crohns, I have celiac, my grand sons have glycogen storage disease and my husband has chronic inflammation. It sounds like we can all benefit from this product but not sure which to buy. Please help!! Thanks in advance! Most of Jon Barron's recommended formulas are sold at Baseline Nutritionals, including this one, where you will also find their coupon codes. I'm unable to find confirmation for a delay in stomach acid production. Could you point me to a physiology source? Thanks. I simply want to commend Jon Barron for his excellent articles involving physiology and nutrition. The articles on the digestive system were outstanding! Keep 'em coming, Jon, and thanks.